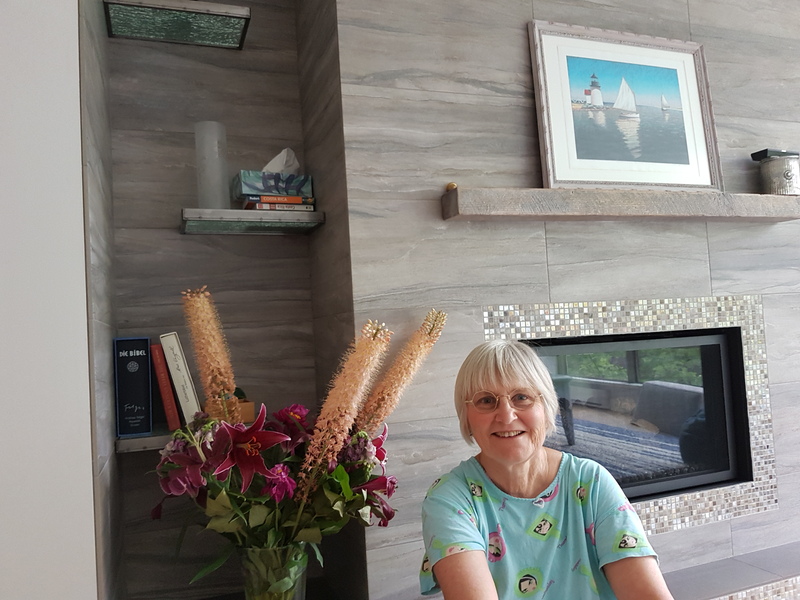 Sheila came back from Europe on Monday and we are enjoying our time together in Vancouver. We are busy seeing friends, going out to nice restaurants, walking, bicycle riding etc. Unfortunately, the weather is not all that great, a bit chilly and grey or rainy. That also gives us lots of time to read the news, among the items a report of a great white shark off Mallorca (click here). I guess we will have to keep our eyes open when we return there in November. 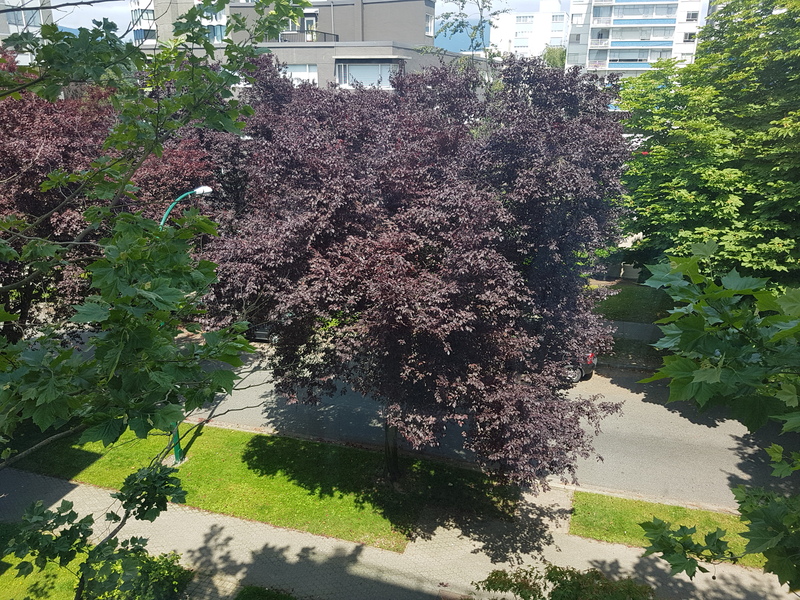 I came back to Vancouver today, the weather is still great and I am enjoying our flat. Summer is here with a real heat wave. Today it was 30 degrees, even being out on the water. The nice weather is forecast to last for a bit, great! 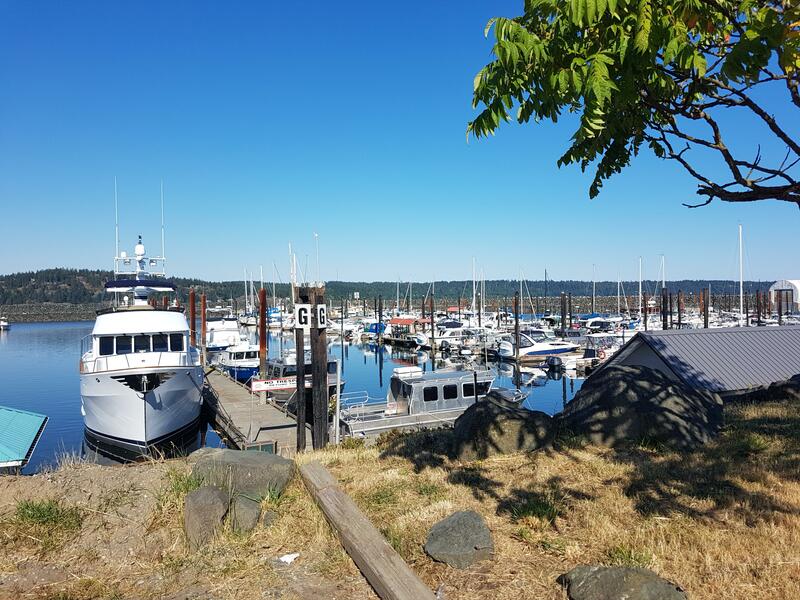 I came into a marina in Campbell River today to get the stuff I need for the boat maintenance. The day before yesterday, I used the dry morning for a 15km hike from Waiatt Bay to Newton Lake and Granite Bay. Great, and I got back only shortly after it started to rain. Yesterday was cold and wet, today the weather improved and tomorrow should be sunny again. I came around the north of Quadra Island today, this involves running two sets of tidal rapids: Osikollo Channel with Upper Rapids, which I took in the morning, then a nice long break at the Chained Island Group, and Seymour Narrows in the evening. 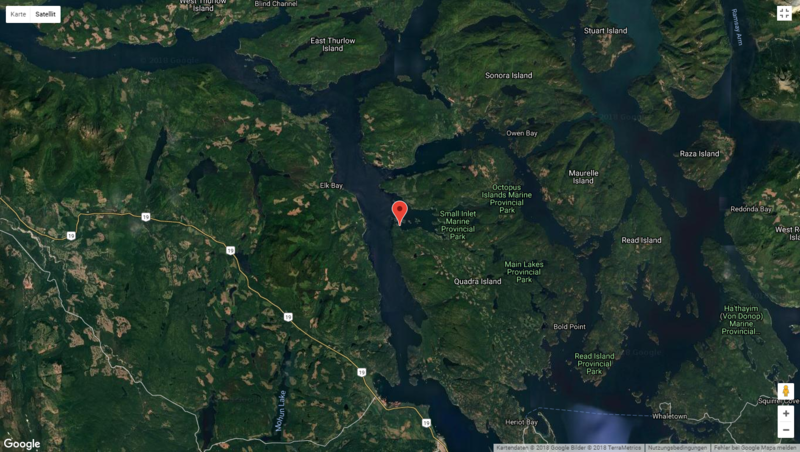 All without any difficulties, though traffic in Seymour Narrows was heavy with cruise ships, fishing vessels and pleasure craft all trying to get through a narrow bit of water at the same time. 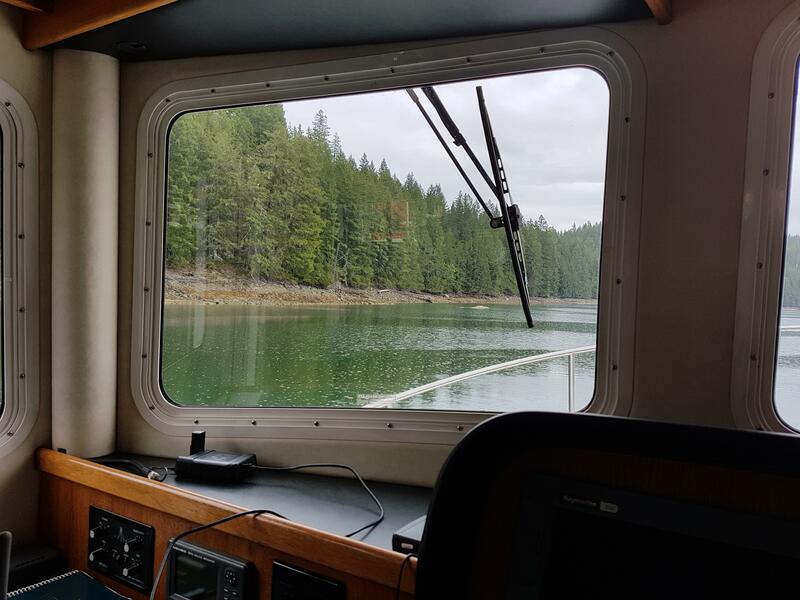 As it is a new moon, the currents there are very strong, up to 15 knots (28 km/h), which leaves a time window of only minutes for slack for small boats like Ancient Murrelet to get through there. 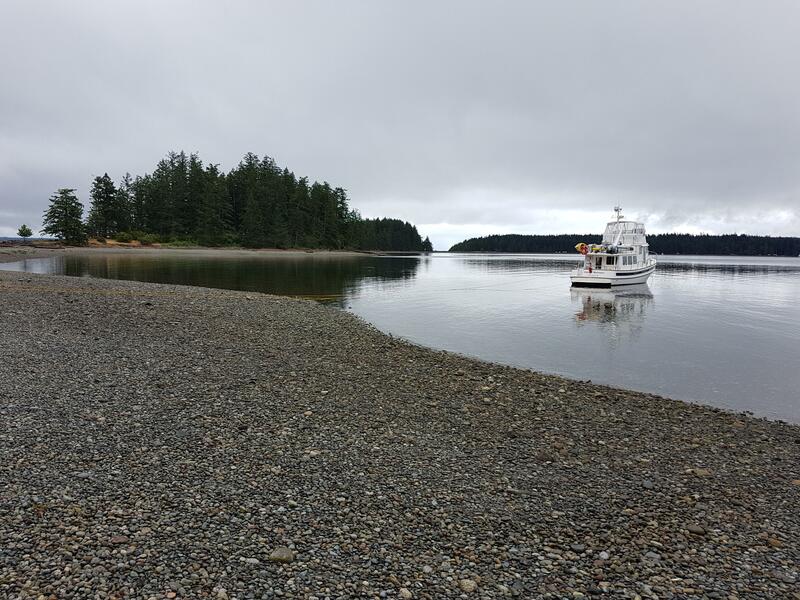 Now I am anchored in Gowlland Harbour, a well protected and rather scenic bay across from Campbell River. I left Drew Harbour today after enjoying a nice Sunday roast at the Heriot Bay Hotel yesterday. Today was sunny, but still fairly cool. The next two days are supposed to be wet and cold again, before summer returns. I am anchored in Waiatt Bay now, and there is a surprising large number of boats in here for the time of year. After a few very windy days, today is calmer but the morning was still cold and very wet. This afternoon the rain stopped and I am anchored now in Drew Harbour behind Rebecca Spit. I saw humpback whales on the way, too rainy for a picture, and then again from the beach when I went for a walk. Hopefully the weather will continue to improve over the next few days. I enjoyed my quiet days in Von Donop Inlet, but did not see any wolves. Today an emergency loomed as I seem to be running low on red wine. I came into Gorge Harbour to re-provision, and on the way stopped to observe two humpback whales feeding, looked like a mother with calf. Unfortunately, it was rather windy and bouncy, so the pictures did not turn out very well and as it was a small calf, I stayed well away. I left Prideaux mid day, stopped in Refuge Cove for some groceries and then came into Von Donop Inlet, where we have been quite a number of times with various members of the family and friends. It is raining today, good time to read some of the books I picked up on the way when I had good reception. 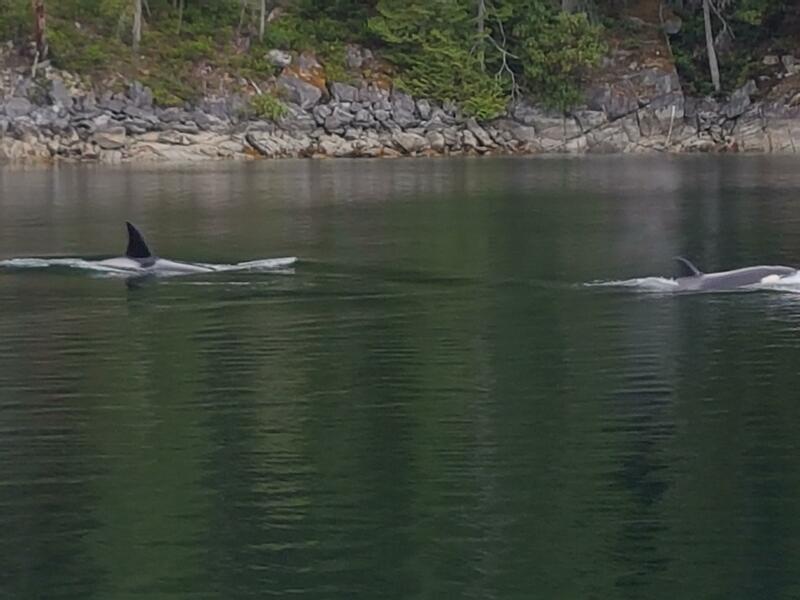 This morning I took the paddleboard around Eveleigh Island and just as I got back, a group of orcas travelled through Prideaux Haven and came very close to the boat. This time I got a picture.